We’ve had a busy autumn! During the last three months, our small team has trekked all over Wales to meet you—the horticultural businesses of Wales, and we’re just getting started. From fungi growers and community gardens to apple pressers and nurseries, we’ve met dozens of horticulture businesses of every type. We’ve tasted edible flowers in rural Denbighshire, stood ankle deep in mud in inappropriate footwear in remotest Conwy, and attended horticultural and agricultural seminars in Cardiff and Aberystwyth. 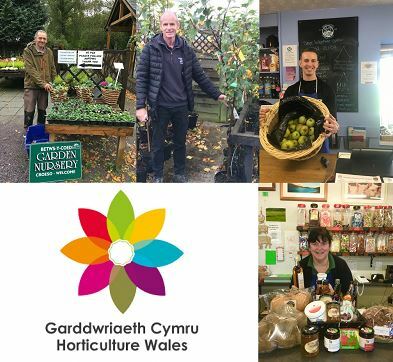 Funded by the Welsh Government, we’re helping horticulture businesses in Wales thrive by encouraging waste reduction, reducing packaging, and shortening supply chains. We’re here to help you. If you sign up to the project, we’ll do our best to help your business grow. We offer bespoke advice, serve as a platform for businesses to network and establish clusters, and enable connections between growers and producers. So please, get in touch, and we’ll do our utmost to help you over the next few months and beyond.